I've never done a marathon or half-marathon before. Can I do it? Absolutely! Thousands of people every year decide to participate in their very first marathon or half-marathon. Provided you allow yourself enough time to train and build up stamina, you’ll do fine. If you are intimidated by the prospect of such a long distance, consider starting with a 5K or 10K event in your community and then building up to a half-marathon or marathon. I'm in a wheelchair or use a handcycle. Can I participate? It varies by event, depending on the terrain of the race route. 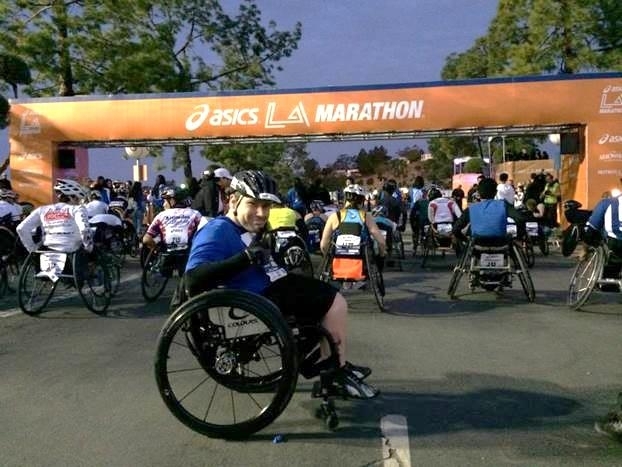 Some races will accept wheelchair or handcycle participants and others will not. Please refer to the race you are interested in for more information. Does Team Spina Bifida have a coaching program? At this time, we do not require or offer a coaching program. We let you train on your own time and schedule, but provide motivation along the way. If you feel like you need a formal coaching program, we may be able to find one associated with your chosen race for a small fee. I've never raised funds before. How hard is it? Fundraising is the easy part. Most likely, you are interested in joining Team Spina Bifida because you or someone you know has been impacted by Spina Bifida. Your story or that connection is a natural way to spread awareness and raise funds for SBA. We will provide you with all of the tools you need to be successful in your fundraising efforts, including a toolkit full of samples that you can easily adapt to fundraise via mail, e-mail, and social media. You can also hold events to raise money. What will my fundraising minimum be? It varies by event. Some marathons in which SBA holds official charity slots have higher contract minimums than others (NYC Marathon for instance). On average, our minimums are around $1,250 for a marathon and $600 for a half-marathon. Please refer to the event you are interested in for more information. That depends on when you sign up. Regardless, all funds must be received by SBA no later than 30 days after your event. Any participant who has not met their fundraising minimum by that time will be charged for the balance. We will either charge your credit card in one lump sum or you can set up a payment plan. Is there a fee to register with Team Spina Bifida? Yes. The registration fee is $30 per participant for each event. The fee covers the cost of your racing shirt, fundraising toolkit, personal webpage, and staff support. Yes. If you join an official Team Spina Bifida race, SBA will pay for your marathon entry fee. You will also have the opportunity to connect with other race participants at a pre-race dinner the evening before your event. If you opt to choose your own event, we will reimburse your marathon entry fee provided you hit your fundraising minimum. If I sign up now and something comes up preventing me from doing the event, will I still have to raise the minimum amount? No. By registering for Team Spina Bifida, you are indicating your intent to participate and raise the funds necessary for participation. As soon as you register, you can begin fundraising. Approximately 30 days prior to your event, if you have not already met your fundraising minimum, you will be required to sign a Commitment Form, providing SBA with your credit card information. SBA will hold onto that form until 30 days AFTER your event. If you have not met the minimum by then, SBA will charge your credit card for the difference between what you raised and your minimum. If something comes up and you can no longer participate in the event, you can transfer your registration and any funds that have been raised to another TSB event (if available) or drop out completely. There will be a one-time $150 fee for any transfers. Please keep in mind, however, that once SBA pays your marathon entry fee, that charity slot is filled and cannot be filled at a later date by another participant. If you drop out, you are not only costing SBA the marathon entry fee, but the minimum you would have been responsible for raising as well. Please do not sign up to participate unless you are committed to the program. Will SBA pay for my travel and hotel accommodations? Most participants opt to cover their own travel and hotel accommodations simply because they like to have control over flights and options. However, SBA would be happy to work with you on arranging your travel for a destination marathon. By setting a higher fundraising minimum, SBA can cover both for you! We also have an official travel company that we can refer you to for planning purposes. Please e-mail Liz Merck, Director of Development, at emerck@sbaa.org or call her at (202) 944-3285 x23 or (202) 618-4754. She will be happy to answer any questions you have.